In May of 2014, I was excited to learn THREE was releasing nail polishes. And, as pretty as the shades were, none of them were exceptional original, or "hold the press! Part the Red Sea and make me run out of the house to buy them now" worthy. However, the THREE Future Noir Collection featured four new polishes. Now, these four shades were more my cup of tea, not being about to buy just one, I picked up two to try. 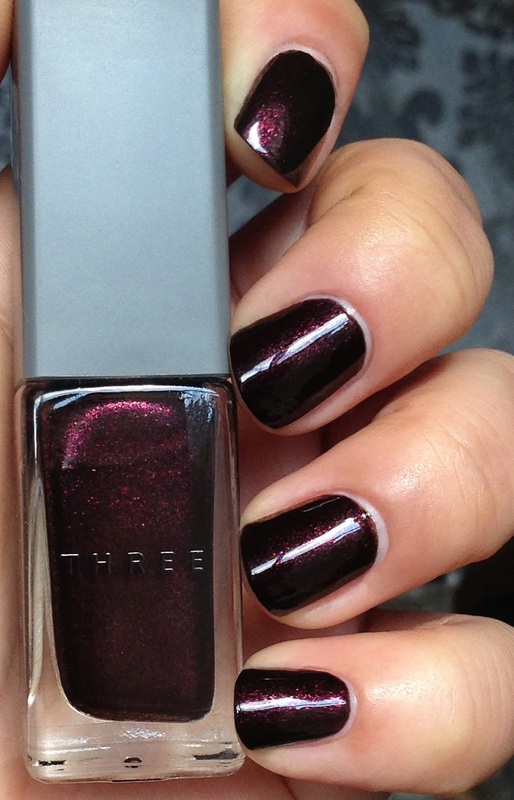 THREE's Nail Polish in 16 Dark and Stormy, looked stunning as it radiated so beautifully on the counter; it literally stopped me dead in my tracks. Keeping with the brand's harmonious infusion of nature, grace and minimalism, the packaging is elegant and pragmatic; with its elongated glass bottle and removable, plastic over-cap, it reveals a cap that is comfortable to hold. 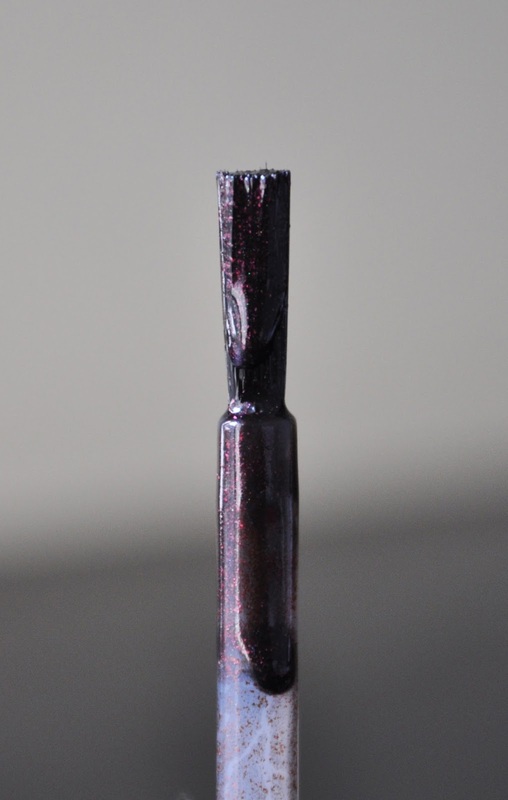 The polish also has a flat brush that fans out well, allowing for a precise and controlled application. THREE claims their polishes keeps nails healthy, and moisturized, with the blend of five species of plant oils: sugar squalane, avocado oil, meadowfoam seed oil, jojoa oil and rosehip seed oil. The polishes are toluene free, formalin free, phthalate and dibutyl free. Dark and Stormy is a bark-brown based, blackened-purplish-maroon with dark pink shimmer. The formula is smooth, easy to apply, hassle-free, drys quickly, and wears for about four to five days. I don't want to say the finish is dull, but the glossiness isn't as intense as an Addiction polish. 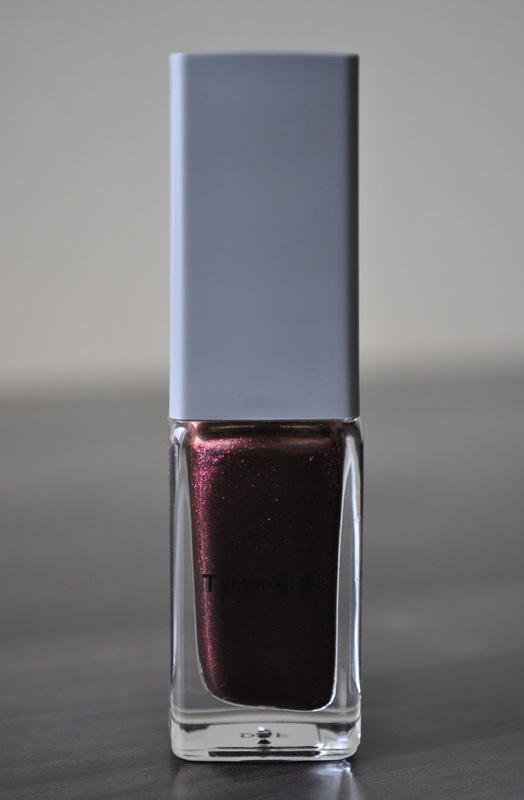 A good top coat is needed to achieve the scintillating radiance the polish has in the bottle. THREE nail polishes contain 7ml and retail for 1,944 yen. 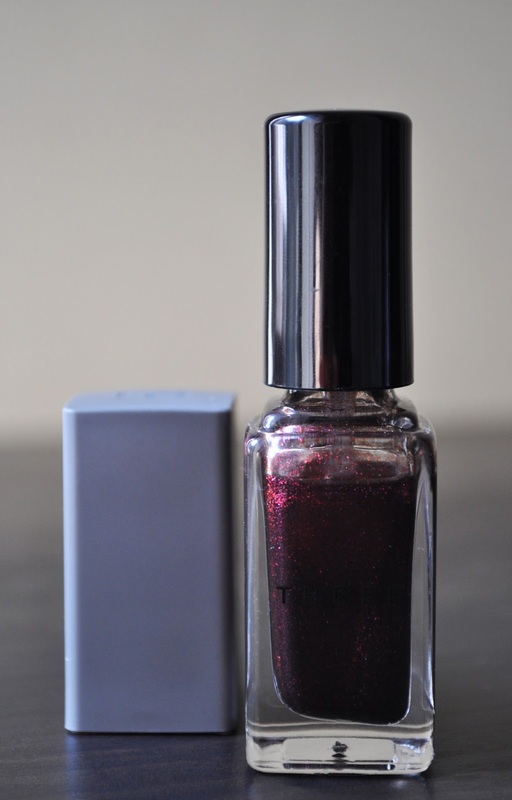 I think it is similar to my beloved Chanel Malice #637 nail polish L.E from holiday 2012. Perfection! Sad that THREE cosmetics are not available in my country. Hope you enjoy it! Big hugs from Greece. Kisses from the land of the rising sun. No I have not a blog :( btw I am amazed by your photos from the cherry trees! Spring is absolutely gorgeous in Japan. Wow!!! This is a pretty one indeed. I super like the color and the finish. I think its really worth the try. Looks even better in the sunlight Jessica. IF you can find it, don't hesitant and buy it!